Awamori and snack foods are concentrated on a parking lot next to the Okinawa Martial Arts Hall. 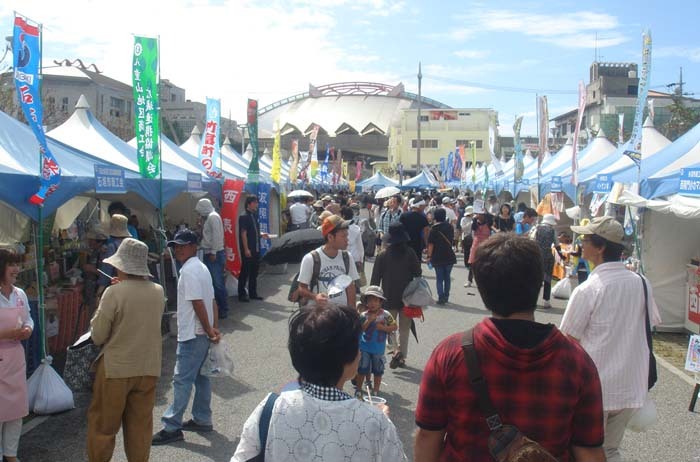 There’s not a better place to see what Okinawa makes, grows or processes than the three-day annual industry and business fair called Okinawa Sangyo Matsuri at Onoyama Park in Naha this weekend. Okinawa Sangyo Matsuri is the one of most popular festivals on the island with over 200,000 people visiting the venue over its three-day run. As the parking is limited and alcoholic beverages are served as samples at the venue, organizers ask visitors to use public transportation like a bus, taxi or monorail instead of their own cars. Those who use monorail to visit the festival can get a free glass of highball or awamori cocktail at the Helios Distillery booth by showing the monorail ticket. This offer is not available for anyone under 20 years of age. 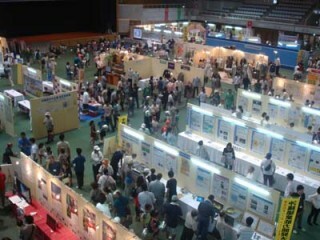 About 500 firms and organizations are scheduled to stage exhibits at Okinawa Prefecture Budokan martial arts hall, around the fountain, along the river, various athletic venues in the park, and along winding paths. Some 3,000 products will be on display. Food and drink stalls and booths selling health foods and crafts are located on the path along Kokuba River. The robot suit at the fair was made by former students of the Okinawa National College of Technology who n ow reside in Tokyo. It has been really popular at various events throughout the country. This is the first time it is shown in Okinawa. Creators of the suit say they are very happy to introduce it to people of Okinawa, and would like young people here to know how much fun it is to make something like this. The public has also a chance to try the Skeletonic suit for themselves on Saturday and Sunday starting at noon on both days. Participation is limited to the first 30 people on both days. Numbered tickets are given out at 11:00. The exhibition inside Budokan Hall highlights Kariyushi wear. Other highlights of the fair are the Kariyushi wear exhibition in the Budokan Hall with a special focus on how to wear Kariyushi clothes at a wedding party. An Awamori Fair on a parking area next to the Budokan is always popular. Every awamori maker in the prefecture has a booth at the fair with many displaying new products for the first time, and everyone offering tasting for free. And what is even better, many food processors have their booths strategically located between awamori booths offering free samples of their products. However, visitors are reminded that they should have a designated driver or use a taxi after visiting the Awamori Fair. 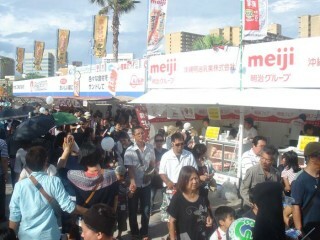 Most of Okinawa’s municipalities have booths at the fair showcasing their sightseeing spots and specialties. Vendors of building and stone materials and agricultural and forestry producers have an exhibition at their own area. Food and beverage booths are mostly organized along a path by Kokuba River, as are health foods and crafts. Orion Beer Garden is located in the east part of the park outside of the Athletic Stadium, and a pottery market is on the north side of the tennis courts. The fair is open from 10:00 to 20:00 on all three days. Admission is free. There is no parking available at the venue, but temporary free parking is available at Naha Military Port with free shuttle buses running between the port and Onoyama Park every 15 to 20 minutes between 8:30 and 21:00 on all three days.